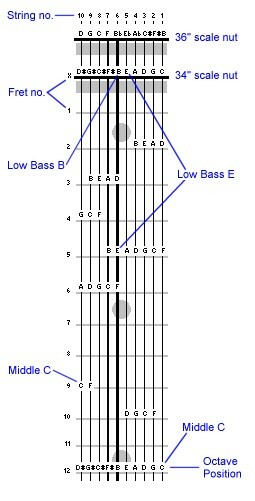 This tuning combines a standard bass 4ths arrangement with a Stick (inverted bass 5ths) tuning to provide myriad ways to fill the bass player's role. A 6-string bass tuning covers the first 6 strings, overlapping onto the 5-string inverted 5ths Stick tuning. Conceptually, it's a set of 11 strings using only ten, with both sets sharing the common low B.